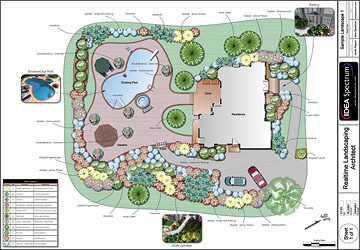 Design professional landscape plans and presentations. 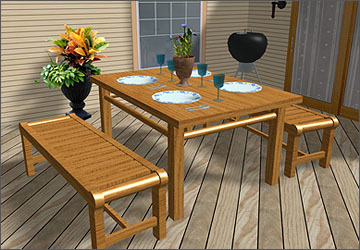 Added over 200 new accessories and other objects, such as greenhouses, barbeques, and lawn furniture. Total is now 12,800 objects, including 5700 plants and 1200 accessories. Easily landscape large areas using the new Plant Fill tool. Multiple plant varieties can be used per area, making it easy to create planting beds with dozens or even hundreds of plants. Use the new Plant Row tool to easily add rows of plants, such as trees lining a driveway, flowers along the edging, and more. Use the new Plant Label object to show clients a 3D view of key plants. This is now an option in the Plant Label Wizard, so you can easily add these advanced labels with just a few clicks. Add impact to your Plan view using 3D callouts. These add a 3D rendering of your landscape from any viewpoint, and help make your plan view look even more polished and professional. Create your own custom models using the new integrated 3D modeling tools. Create models from scratch, or use any of Pro’s existing models as a starting point. Create boxes, ramps, cylinders, extrusions, lathes, and more. Edit points and polygons, set shaders and textures, and more. The tools are surprisingly easy to use, and several tutorials are provided to help you get started. No prior CAD or modeling experience is required. Design more complex shapes easily using the new Offset and Mirror tools. Mirror single objects, groups of objects, or even your whole design with a few mouse clicks. Create more realistic 3D renderings using the new advanced lighting features (3D video card required). Specular highlights and improved soft shadows ensure your walkthroughs and presentations are more realistic than ever. Create impressionistic renderings of your Realtime Walkthrough screenshots with effects such as watercolor and colored pencil. Use the new Preview feature for a quick preview before rendering at full size. Easily transfer landscapes with custom data to other computers via the new Archive command. Save archives of your landscapes which include all custom data for fast and easy retrieval. Gain new levels of accuracy with the new snap options, including point, edge, perpendicular, and more. Place text in a variety of languages using the new Unicode support. Foreign currency symbols are also supported. Quickly adjust the Perspective view using the new 3D Nav Wheel. This is especially useful for helping new users learn how to navigate in 3D. Save viewpoints for easy access using the new Edit Viewpoints feature. Save important viewpoints such as gardens, decks, and birds-eye views. Restore them while designing or during client presentations with a few mouse clicks. The number of viewpoints is unlimited, so you can use as many as needed. 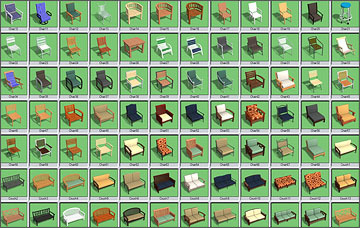 Import more complex models with improved SketchUp support. Textures, colors, transparency, smoothing, and more are now imported more accurately than ever. Create fast 3D views from a stationary point using the new 3D Panorama option. This super-fast presentation option works especially well when showing clients your designs on a slower computer. 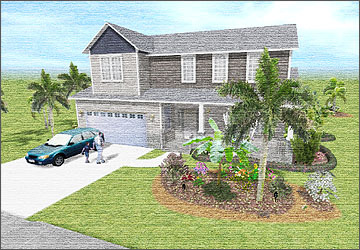 The software includes the full version of Realtime Landscaping Photo 5, which has also been enhanced and updated. The help window has been redesigned and now includes symbols for mouse and keyboard actions, making it easier to see at a glance what the available options are. The software also includes many other improvements based on customer feedback. Now includes over 12,800 objects. Improved realism with advanced lighting and shadows. Sample of the Pencil Sketch impressionistic rendering style. Create custom models using the integrated 3D modeling tools. 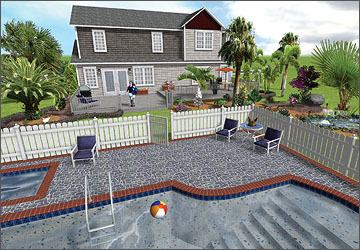 Add impact to your landscape plans using 3D callouts. New integrated 3D modeling tools.